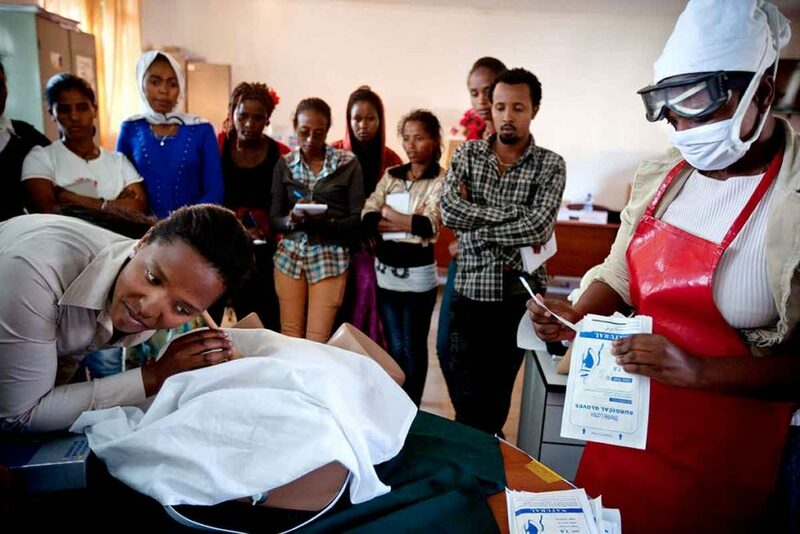 The Human Resources for Health Project in Ethiopia is strengthening the education of midwives, anesthetists and nurses as part of an ambitious effort to build a robust health workforce. After 16 hours in labor, Ergoye Nega had made little progress toward giving birth. The nurse at her local health center advised the 34-year-old mother of two that she must go to the hospital—her baby was in distress. An ambulance drove Nega and her husband 15 miles to Metema District Hospital, in the Amhara Region in northwest Ethiopia. “The surgeon quickly determined the situation and told me that I should be admitted for emergency surgery to save me and the life of my baby,” she recalled. Nega agreed to a cesarean birth and within 30 minutes her healthy, 8-pound newborn son was placed in her arms. Nega is one of 172 women who have benefited since the resumption of emergency surgical care at Metema Hospital, which was made possible by a 2013 agreement that designated the hospital as a clinical teaching site for students from the College of Medicine and Health Sciences at the University of Gondar. This agreement also expanded the number of surgeons and anesthetists at the hospital who could supervise the students. “My life was saved because the service was available on my arrival at Metema Hospital. If the service had not been there, my baby’s and my life would have been endangered. My baby is doing well now and my husband and I are very happy. I’m also healing well,” said Nega. Cesarean and other essential surgeries had not been provided at Metema Hospital since 2005. In the interim, pregnant women in the district who experienced complications at birth had to travel more than 60 miles to reach a hospital that offered emergency surgery to save women’s lives. But with the 2013 signing of the agreement between Metema and the University of Gondar, trained staff were once again able to provide cesareans at the hospital. The Gondar-Metema partnership is just one example of the impact of the Strengthening Human Resources for Health (HRH) Project, funded by the US Agency for International Development. The HRH Project is also supporting agreements between the University of Gondar and five other hospitals. These partnerships are part of an ongoing effort by the government of Ethiopia, academic institutions and hospitals to strengthen the health care system by developing a robust skilled health workforce to deliver and maintain high-quality, lifesaving care and reduce the number of maternal and newborn deaths. The HRH Project is led by Jhpiego and implemented with partners, Management Sciences for Health, Ethiopia Midwifery Association, Ethiopian Association of Anesthetists and Open University. The ambitious project has upgraded curricula for health workers; shared new teaching approaches and retrained faculty; and provided up-to-date teaching materials. The project also helped accreditation and regulatory bodies improve health training institutions and introduce licensing exams to ensure that new graduates are competent and safe health practitioners. The University of Gondar is the preeminent medical university in Ethiopia and currently provides training for more than 4,000 health science students, including midwives, anesthetists and nurses. Growth in the number of students at the university generated increased demand for clinical practice experiences. Existing facilities offered limited opportunities for students to practice their clinical skills in true-to-life situations. The increased demand led to overcrowding of students at the facilities that offered clinical practice, contributing to discomfort for patients and fatigue and frustration for providers. The HRH Project advocated for additional clinical practice sites, which led to the agreements between the University of Gondar and Metema Hospital and the five other health facilities. These agreements outline roles and responsibilities for supporting students during clinical practice and include sustained technical support from the HRH Project. To strengthen human resources at its partner hospitals, the University of Gondar provided short-term training for nurses to enable them to assist with surgical procedures. The university also assigned anesthetists to work 3- to 6-month rotations at Metema Hospital and identified senior surgeons and surgical residents to assist the hospital as it began to offer surgeries again. The Amhara Regional Health Bureau further supported this initiative by assigning four emergency surgical officers and three anesthetists to the hospital. As an affiliate clinical site of Gondar, Metema Hospital is now providing expanded health services in a district with 250,000 people. Now, obstetricians are regularly assigned to manage emergencies and complications at birth; essential materials are available; and the operating room is functional. Health workers are better equipped to manage maternal and newborn conditions in the hospital and to coach students during clinical practice. According to Lewtie, women are no longer being referred to other hospitals for obstetrical emergencies. With six facilities enrolled in this effort, University of Gondar students can be assured of a more diverse pool of caseloads, numerous opportunities for surgical practice and, ultimately, clinical competency upon graduation and deployment. And as a result, more women like Nega will be provided with lifesaving surgeries. Fantu Abebe Eyowas is an education and training advisor in Jhpiego’s Ethiopia office.